I received the silicone rings at an extremely discounted price. I love the packages of the rings. They are super comfortable and very durable. I tried on the size 8 ring and it fit me. But my real ring size is a 7, so if I order the women’s rings the sizing probably would be off. The clean up is super easy and it’s perfect for men in construction or in the military. For 95% of men, this pack of 5 silicone rings contains a size that fits. No worrying about how the ring sizes run, or having to trouble with a return. • GUARANTEES GETTING THE RIGHT SIZE: 5-PACK of Silicone Wedding Rings men’s sizes (8, 9, 10, 11, 12) in Black guarantees you receive a ring that fits, without the hassle of figuring out the correct size or returns. 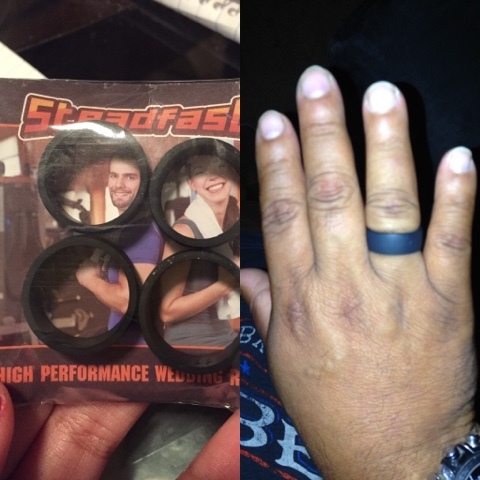 This Silicone Wedding Band set solves the top complaint of buyers of silicone rings on Amazon.com in their reviews – receiving a ring that did not fit. • ALL DAY COMFORT: Medical hypoallergenic silicone is chemically inert and will not cause skin reactions as metal rings sometimes do. These Silicone Wedding Bands are smooth, without any large embossed or debossed logo or grooves that can irritate your finger. • SUPERIOR SAFETY: Non-conductive and designed to break away above 40 lbs of pressure, making this silicone wedding ring ideal for anyone who works with electricity or in professions or activities where rings can catch. • LONG LASTING: your silicone ring withstands strenuous activities that would mar traditional metal wedding bands. Impervious to water. Mechanical repairs, rock climbing, workouts, water skiing are all safe to enjoy with the silicone wedding ring.